I have a love/hate relationship with confectioner's glaze...It gives gumpaste a nice glossy finish, but it's sticky as #$&*% and impossible to get off of things once it's on there. 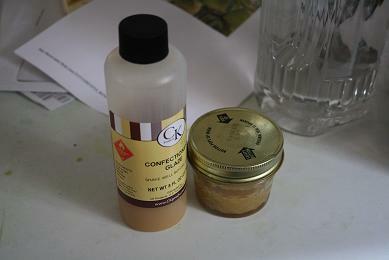 Confectioner's glaze is technically edible, but it's basically a type of shellac, as I understand it. I have two types and they both have very cryptic ingredients listed on the bottles. One says "food grade refined bleached lacquer" and the other says "50% candy glaze, 50% grain alcohol." Woo hoo! It does smell horrible, too, which wouldn't make me want to eat it, even though the stench does dissipate after a while. So after that ringing endorsement, I would say that it works really well to make gumpaste look like it's shiny or waxy, like in the petals of orchids or leaves that have a gloss to them. Gumpaste berries also look really good when they've been dipped in glaze. You can make your own glaze by combining 1:1 corn syrup and vodka, and then altering the proportions based on the look that you want. This tends to stay sticky, though, and it takes a long time to dry. Commercial glazes dry quickly and aren't sticky when they dry. You can get thinner for them so that you can clean the paintbrushes or containers that you use with the glaze, but if you don't have any thinner you should plan on having a separate and/or disposable container to hold the glaze. 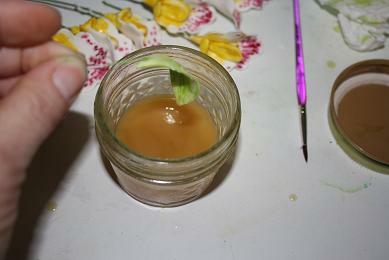 The glaze will get onto your paintbrushes and ruin them without the thinner, so be careful what you use to apply it. The easiest way to cover the petals of a flower would be to dip them, but again, make sure that you're using a container that can be thrown away. 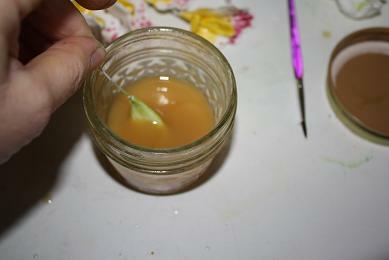 I use canning jars that I can put the lid on after use, and that keeps the glaze from drying out so I can use it later. If you're going for a one-time use, you can use an old yogurt container or other plastic container, then just throw the whole thing out. 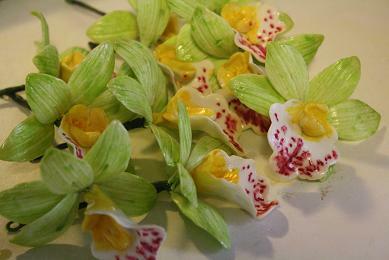 If you've colored the petals with food coloring let them dry, then dip them into the glaze. If they've been brushed with dusting powders this will also work, but the colors will contaminate the glaze after a while, so keep one jar for red, one jar for green, etc. 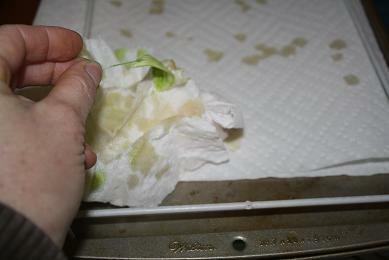 Gently shake off the excess and tap the petal onto a paper towel to absorb some of the excess liquid. I hang the petals to set up, because if you put them flat on a piece of waxed paper the glaze can pool in the spot that's touching the surface and leave a mark on the petal. If you hang them, the extra liquid can drip off the petal. You should check to see if there's any that hasn't dripped off of the petals and tap it with a paper towel to remove it from the petal. 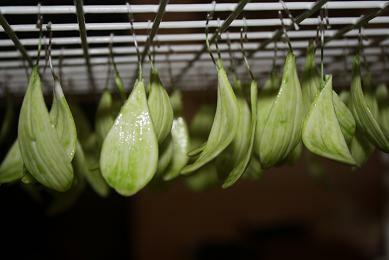 Make sure that the petals aren't touching each other while they're drying, because they'll stick together and be difficult to separate.